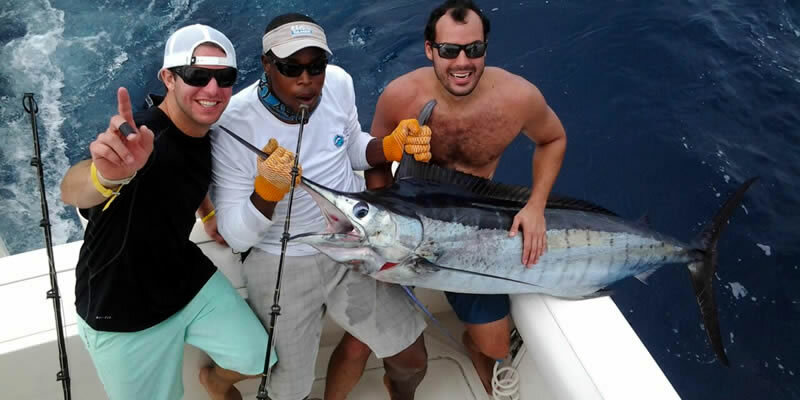 Enjoy A Day Offshore Fishing in Quepos, Costa Rica with Reel In Fishing. 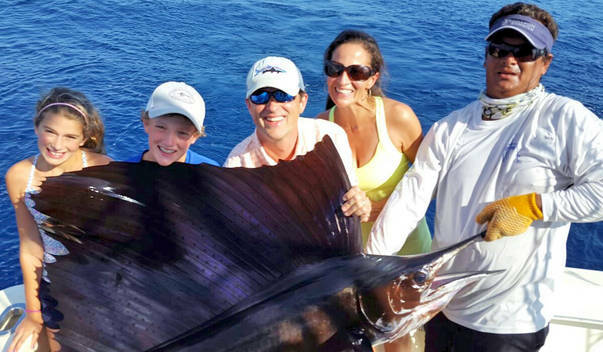 The full day offshore fishing in Quepos, Costa Rica is the ideal fishing charter for those anglers targeting The Big Game Fish such as Sailfish, Dorado, Marlin, Wahoo, and Tuna. The Offshore Fishing or sometimes referred to as Deep Sea Fishing in Quepos, Costa Rica is a fun filled adventure and a must do activity! You can select the Full Day Offshore Charter or the 3/4 Offshore Charter. The full day offshore fishing charters depart no later than 7:30 from the Quepos Dock. The return time can vary between 4:00 p.m. to 5:00 p.m.
Charter will include food, water, beer, soda, ice tea, fruits, and snacks. The boat will be equipped with fishing and navigational equipment. 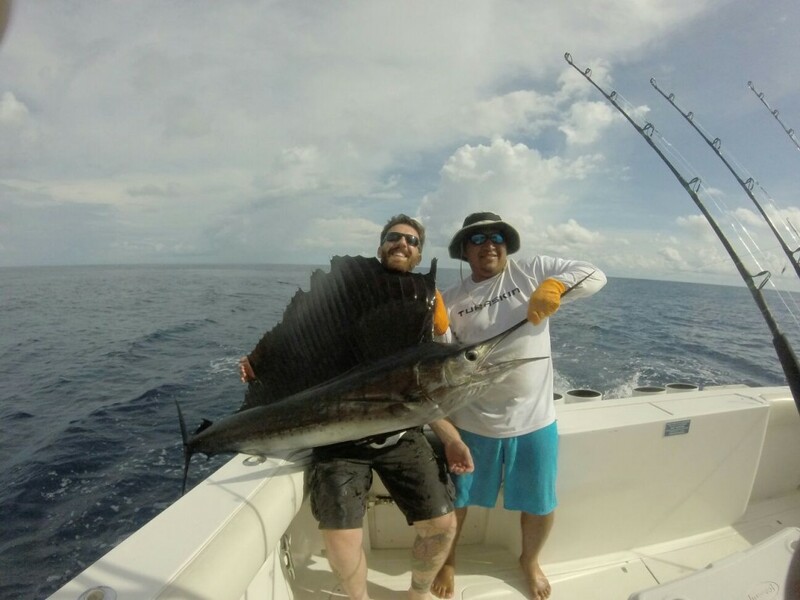 The all day offshore fishing tour will give you the most time on the water than any charter, thus giving you the best chances of having a productive day of fishing. Everyone above the age of 16 must purchase a fishing license which has a cost of $15 and can be bought in the Quepos Marina on the day of the fishing trip. Catch a Big Fish, Don´t Just Dream It! The bate used to fish offshore is called ballyhoo. Trolling is done to make the ballyhoo look as though it is alive and thus attract the offshore species. During an offshore charter you can experience both a morning bite or the afternoon bite, so patience is a very important factor while deep sea fishing. Our boats are fast, secure and fully equipped for the deep sea fishing which will help you to achieve your goal of reeling in a big game fish. 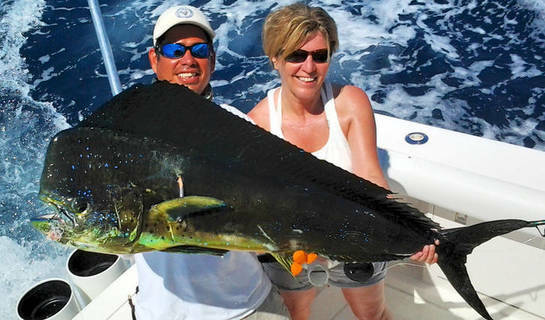 The is by far, our most popular fishing excursion, and your best chance to catch a big sailfish, marlin or dorado. Your All Day Offshore Fishing Adventure begins with “Reel In” Luxury Sport Fishing arriving at your hotel, or Villa in our 15 passenger, air conditioned Van, which will transport you to the Marina. After the short ride, you will be greeted by a bilingual member of our staff, who will help you purchase your fishing license, and take you to your Luxury Fishing Yacht. Transportation is to be arranged via email or phone with the anglers from Manuel Antonio to the Marina Pez Vela, which is located in downtown Quepos. We can also coordinate transportation for those staying in Dominical and Jaco, the price depends on the amount of passengers. The Captain and Crew will be there to meet you with a big smile and the famous Costa Rican saying “Pura Vida”. You’ll soon shove off and head to the fishing waters, where your prize fish await you. Both of our Luxury Yachts provide fast and comfortable rides and you will be in deep blue water, where the fish abound, before you know it. Along the way, you’re likely to see Dolphins swimming in the bow wake of your luxury yacht. Once in the offshore fishing waters, the crew will slow the boat to trolling speed, and deploy the outriggers, teasers and baited hooks. Now it’s time to get ready for some real Big Game Fishing action. Your heart will race, as adrenaline rushes through your veins, the first time a big sailfish, marlin or dorado takes the bait. The crew scrambles to get all of the other lines out of the water, as your First Mate hands you the rod, which now sports a fighting fish, at the other end of the line. Even if you are a novice, and have never experienced the thrill of “reeling in” a big fish, you will look like a True Pro. Our professional crew will assist you, in any way required for you to safely and successfully catch your first big fish. It’s fun and easy, with their help. You’ll thrill to the sight and feel of the big fish jumping out of the water, as he struggles to break free. You have a real fight on your hands now, as your fellow anglers and crew cheer you on. Reeling in a big game fish is an unforgettable thrill. The covered, shaded flybridge of either yacht, is a great place to view and photograph all of the action, when you’re not catching your own fish. It’s breezy, shaded and spacious, and everyone seems to enjoy the fantastic vantage point. There is also plenty of space to stretch out and relax, inside the air conditioned cabin, after reeling in big fish. You’ll enjoy getting out of the sun, or rain, something only a full sized yacht can afford you. Our all day fishing excursions include a delicious, full course hot lunch, prepared in our galley. We pride ourselves in our cuisine, and our clients rave about the food. We like to say; “There are no ham and cheese sandwiches served aboard our Luxury Yachts. Speaking of food, an occasional plate of fresh raw Mahi-Mahi is a special treat, and the all day Offshore trips provide the best opportunity to catch some. The crew will fillet the dorado, affording you a chance to taste the freshest sashimi you’ve ever eaten. We always try to keep a good supply of wasabi and soy sauce aboard, just for sushi lovers. After an exciting day of reeling in sailfish, marlin, dorado, or other big game fish, it’s time to head back to port. Once there, our Van will transport you back to your land accommodations. If you have caught something to eat, you may take it with you. The crew will fillet it for you, and most restaurants will gladly prepare it, if you ask them. There is nothing quite like feasting on fresh fish, that you caught, yourself. This thrilling experience will be one, you’ll long remember and leave you yearning to return to this world famous paradise for big game fishing. This is one of the most common questions we receive from our customers. The species that you are allowed to bring back from an offshore fishing charter are Mahi-Mahi and Yellow Fin Tuna. 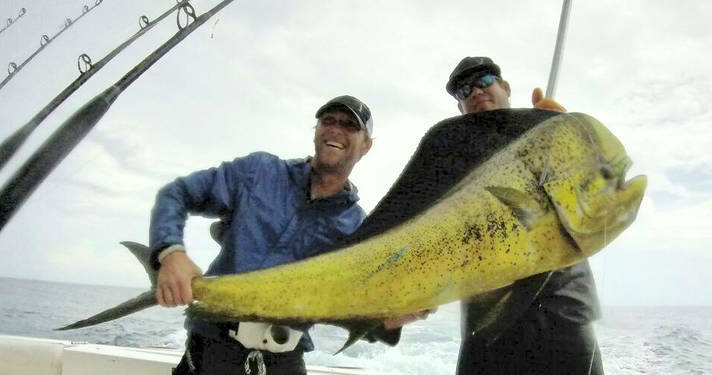 However, the Mahi-Mahi and Yellow Fin Tuna must reach a certain weight and length which will determine as to whether or not you can bring it back. Please take into consideration that Costa Rica has specific rules and regulations which are intended to protect the species that live in these waters. The first mate on our boats are trained to fillet the fish for you and place it in a Zip Blog bag with ice, so that the fish will keep fresh. Afterwards, you can choose to visit one of the many seafood restaurants in the Manuel Antonio area. If you are staying in a Villa or Hotel, you may tell the chef how you want your fish to be prepared.